As Adobe Lightroom Windows users know, this application has been oppressive for users of removable media (disk drives, flash cards), imposing some limitations that puts image culling applications that produce XMP files (including FastRawViewer) in a bit of a bind. It's impossible to cull/rate/label files right on a flash card - they first need to be copied onto a local disk, XMPed, and then imported into Lightroom from there. Aside from problems with flash cards, the same happens with removable USB disk drives. If Lightroom detects the disk as being removable, it wil neither read nor write XMP files from or to that location. Since we're a bit overwhelmed with the questions regarding this problem, and the answer "that's just Lightroom" is both overly repetitive and not very satisfactory, we suggest the following lifehack. 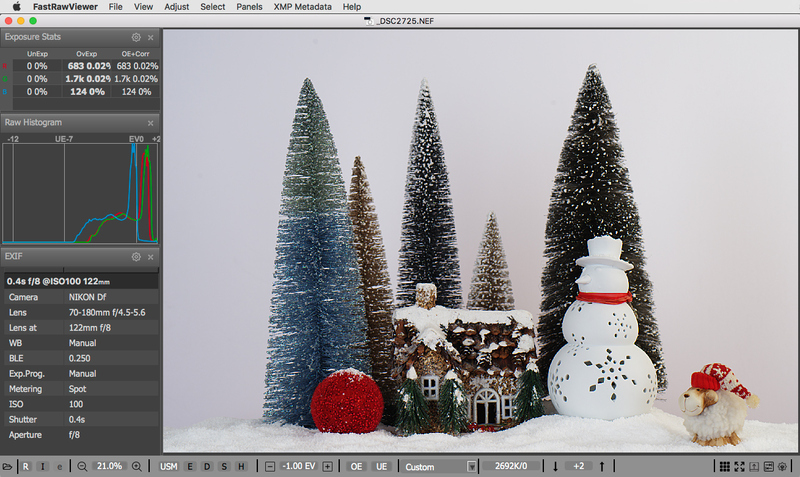 We are going to demonstrate that one of the ways of getting good exposure is metering while using the in-camera spotmeter on the lightest part of the scene that needs to maintain full detail (white clouds, snow, etc.) and applying the appropriate compensation to the exposure recommended by the spotmeter. Thumbnails would not refresh on thumbnail size change. 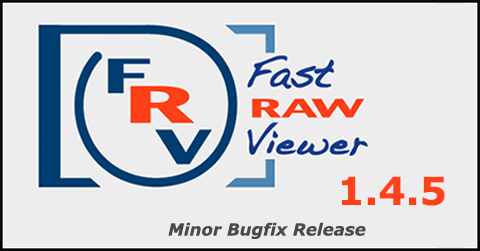 (Windows only) Show file in Explorer and Menu - Help - Auxillary settings scripts was broken in FastRawViewer 1.4.4. Correct handling of striped bitmap thumbnails. Resent copy/move destination lists in menus were damaged after switching 'Single keys act for multiple files' setting. 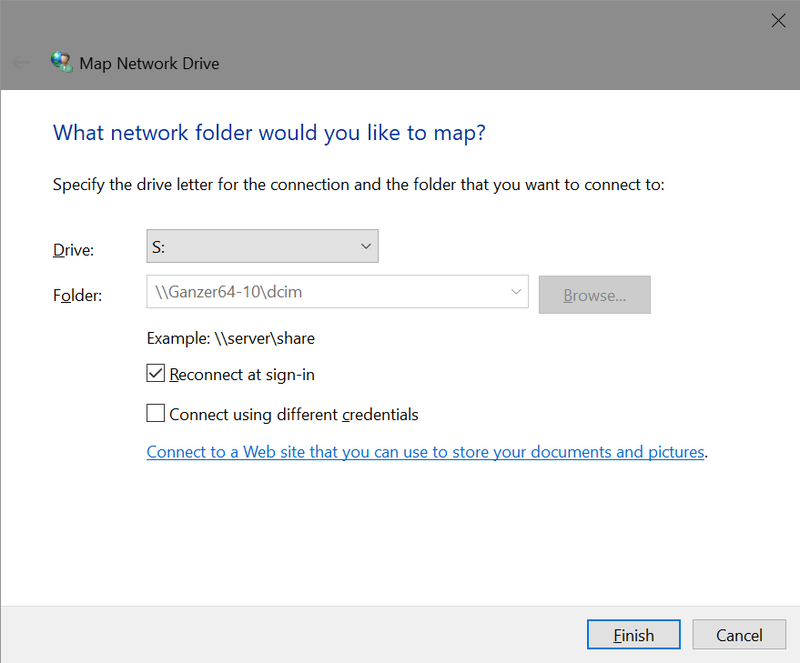 With this option checked, Menu - Select - Load/Append selection from file will ignore the folder part of the file paths stored in the file that is loaded, so selection load/append will become folder-independent. With this option on, folder file filtering is turned off while loading/appending file selection. Without that, only visible (not filtered out) files to be selected based on loaded file. 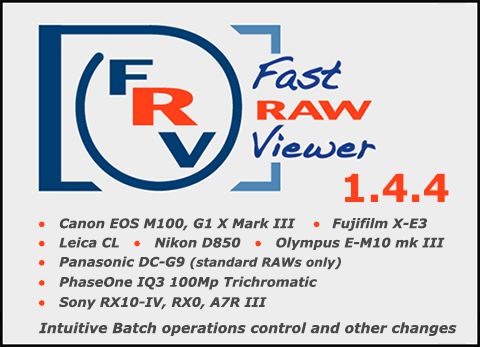 Adobe Camera Raw 10.1 compatibility: camera data added. 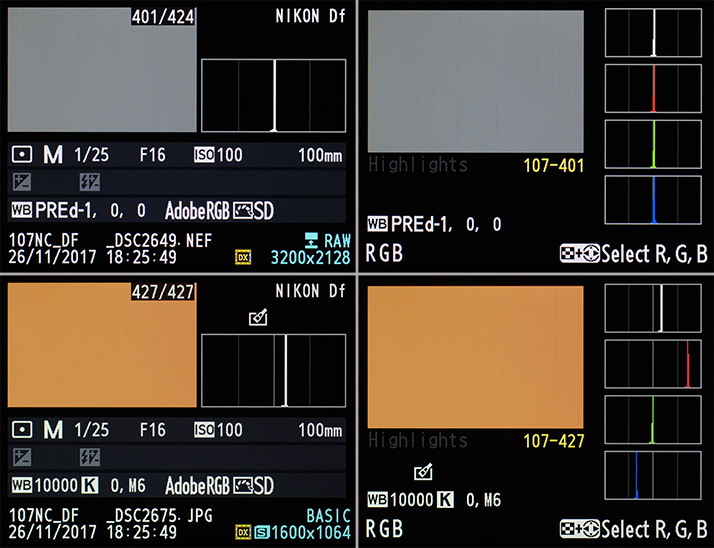 White balance: does it or does it not affect RAW image data at all? 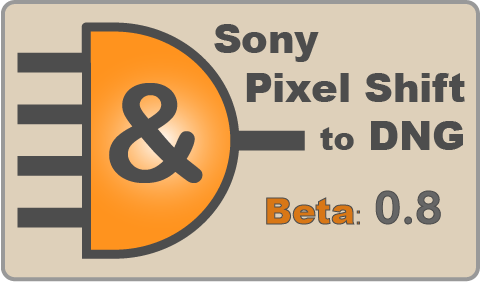 Certainly it affects JPEG, but how and why? 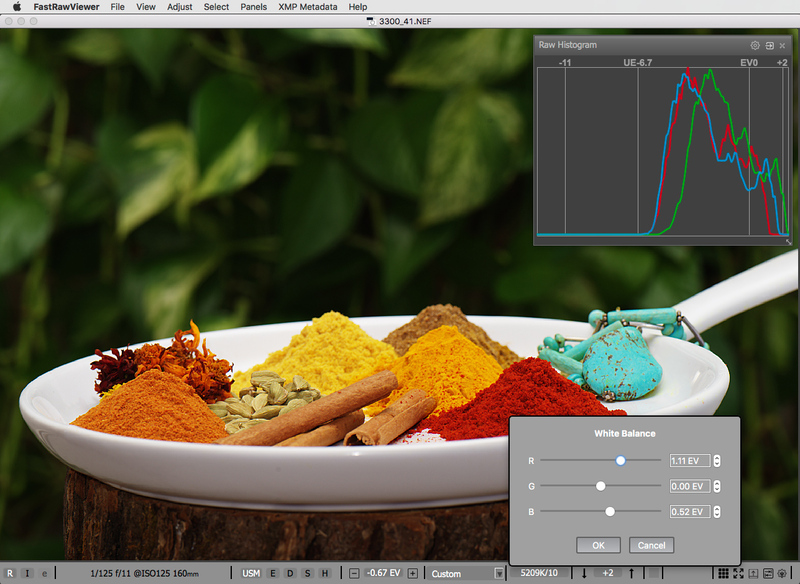 We are going to demonstrate that setting the white balance in a camera has no effect on "normal" RAW data. To do so, we took four shots under the same, fairly constant, light, varying only the white balance (WB) settings in the camera (and the number of roasted coffee beans on the skillet handle). You will see the "as shot" color differs dramatically between the shots, yet the RAW histograms of these shots are, for all practical purposes, will stay the same. You can repeat this simple experiment yourself, and also check that changing the white balance setting does not affect the in-camera exposure metering readings. Not sure how? 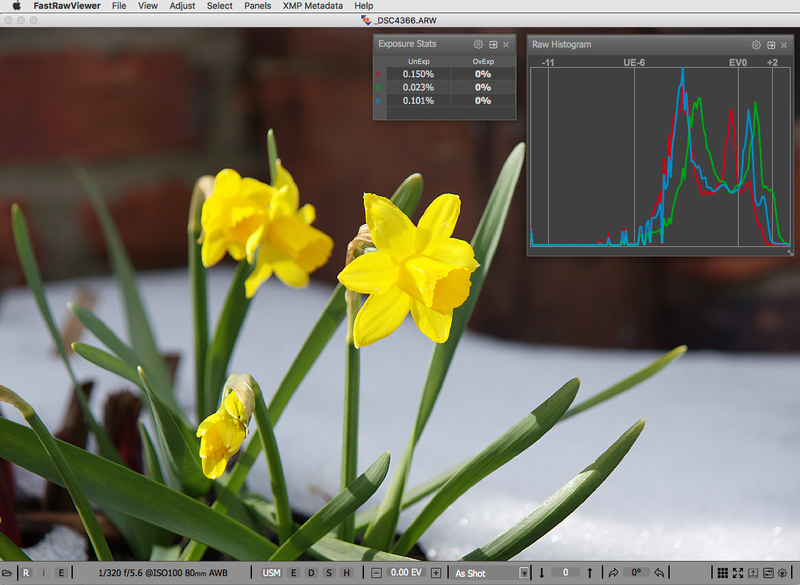 It really is very simple - just rely on the JPEG histogram. The one on the back of your camera will do, or one derived from a JPEG by some viewer, or (sometimes) even by a RAW converter. Many strongly colored objects - yellow, red, blue, pink, orange, purple, etc. are suffering from culling based on JPEG histograms. 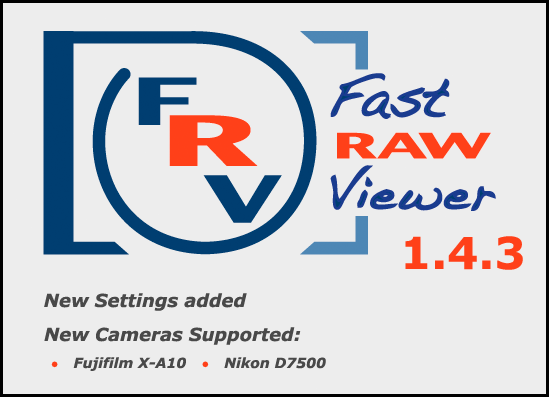 FastRawViewer is the only culling tool that displays the true RAW histogram, which allows you to determine if the shot was exposed correctly. So, if you don't want to trade your (technically) best shots for worse ones, start using RAW histograms for culling! Adobe-formatted contrast setting is now always recorded to XMP files. 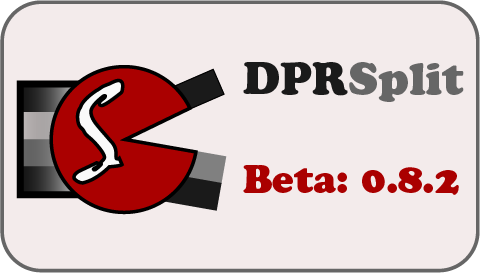 External JPEGs is now used as thumbnails if the corresponding setting is on. Several new actions and hotkeys have been added. XMP data now is always taken from the file on the disk (not from the cache).